The Armstrong Library is lakefront two story cabin with great lake and mountain views from the screened porch and huge lakeside lawn. 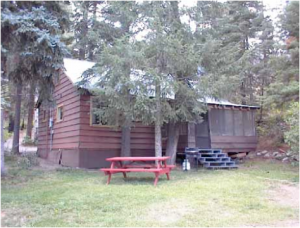 This cabin has a large living room with a fireplace, 3 bedrooms (5 doubles and 2 singles), and 2 new full bathrooms. 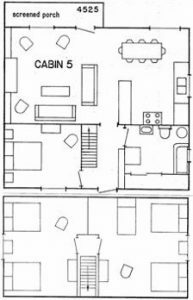 Both the living room and bedrooms are carpeted. The fenced dog yard is perfect for pets.